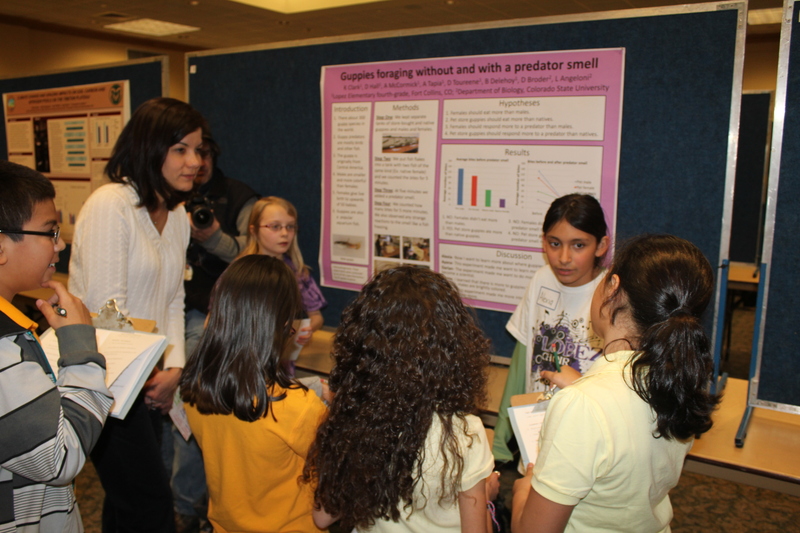 Lisa Angeloni helps Lopez Elementary students present their poster at FRSES. Anna Perez-Umphrey helps students conduct an experiment. This K-12 outreach effort would not be possible without help. I would like to particularly thank my advisor Lisa Angeloni for her continued support. Anna Perez-Umphrey was critical in developing this approach to outreach and spent a full semester working with me every step of the way. Volunteers: Sarah Westrick, Michelle Desrosiers, Emily Ruell, Dr Jake Herman, Chris Dalton, Sam Broder, Monica Paez, Dr Julian Torres-Dowdall, Natalie Pitts, Dr Eva Fischer, Dr Becky Chong, Nate Cathcart, Dr Angela Luis, Dr Sarah Fitzpatrick, Dr Emily Kane, Dr Chris Funk and probably more that I have failed to list, but not forgotten. K-12 teachers: So many teachers have been willing to put in extra time and energy to ensure that their students have a positive experience with science. Katie Guilbert, Britney Delehoy, Stephanie Simmons, Sara Warren, and Kaitlin Dunn have been particularly instrumental. Funding: Support for supplies was provided by separate NSF grants awarded to Lisa Angeloni and Cameron Ghalambor as well as a Society for the Study of Evolution Outreach grant awarded to me. My time at CSU was supported by NSF. At DU I am supported through IRISE.